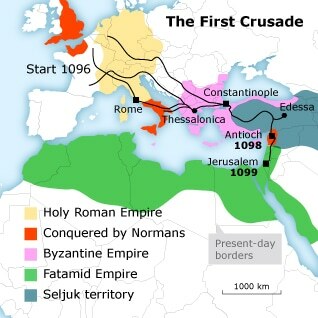 From the end of the 11th century, Palestine was in the clutches of crusaders from Western Europe. These were commanded by noblemen, who were driven both by religious motives as well as a drive for territorial expansion and commercial interests. In 1099, they took Jerusalem, massacring the Jewish and Muslim inhabitants. The eastern Christians were able to escape the massacre due to being expelled by the Fatimid governor of the city Iftikhar Ad-Daula before the siege. Thus, the crusadors were able to establish a kingdom there. A pocket of remaining crusaders managed to maintain hold in and around Acre (Akka) in North Palestine until 1291. More than a century before, the crusading armies, led by Richard Lionheart, had already suffered a heavy defeat at the hands of the legendary general from Cairo, Salah al-Din al-Ayyubi (known in the West as Saladin) at the Battle of Hattin in 1187 in the north of Palestine. In that same year, he took Jerusalem, al-Quds thus again falling into Muslim hands after 88 years of crusader rule. It would remain so until World War I. In 1258, Mongol invaders captured Baghdad and brought down the Abbasid dynasty. Two years later, their advance was stinted by the Mamluks (slaves), soldiers in the service of the Ayyubid sultans (Saladin’s successors), who had afterwards gained power at the Battle of Ayn Jalut in northern Palestine.